Can a moment change your life forever? That’s exactly what happens to Peter Haskell and Olivia Thatcher. Happily married with kids, Peter is the president of a pharmaceutical company (owned by Frank, his father-in-law), which is working on Vicotec, a new drug that could revolutionize cancer care and save millions of lives. Olivia is the beautiful but very unhappy wife of a politician with high ambitions. Their only son has died and the couple has grown apart but she stays with him out of duty and obligations. When the Ritz, the hotel they both are staying at, is evacuated because of a bomb threat and all the guests are forced to wait in the streets until the police has finished its job, Olivia starts walking away on her own in the middle of the night through the streets of Paris. No one notices her but Peter, who, not knowing exactly why himself, decides to follow her and the two end up talking about their lives, their hopes and fears and how unhappy they are for hours. Thanks to Olivia, Peter will also realize that his life, although perfect on the outside, isn’t as good as he always thought. The next morning, Olivia disappears. Her husband doesn’t seem to be too worried about it, but Peter decides to look for her and quickly tracks her down. The two become lovers but they know their relationship can’t last. Five days is all they have and soon, it’s time to go back home. Olivia agrees to stand by her husband as he launches his US presidential campaign while Peter will have to fight with his father-in-law to delay the Vicotec release on the market: as it is, the drug is a potential killer, but Frank is more interested in the profits they could make than in saving people’s lives. I don’t wanna reveal the ending (I really hate when reviews do that) but I’m afraid it is very predictable anyway. In fact, you’ll just have to read just a few chapters to know how it’s gonna end. There really is no suspense in this book and not much action either. And if the word Paris in the title is catching your eye, well, the city is not described that much, really, and only a small part of the book actually takes place there. The writing style is simple and straightforward, but also quite repetitive at times (this is very common in Danielle Steel’s books, she loves repeating things over and over again). The book, although nothing special, does explore some interesting issues: what happens when you marry money or power? How much can we compromise without betraying our beliefs and integrity? And would you leave a life you hate and break up your family for a woman you barely know? These questions may seem very easy to answer at first sight, but life isn’t always black and white and there are lots of shades of grey in between to explore. However, this time it wasn’t that nicely done. I just couldn’t get into the story. I guess that’s because it is just too predictable and you don’t really need to turn the page to know what’s gonna happen next. Overall, a very light read but if you’re interested in Danielle Steel’s books, I would recommend you read Zoya or Vanished instead. They have interesting storylines and are written much better! 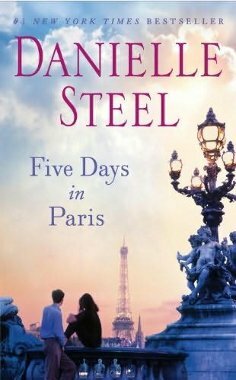 Overall, Five Days in Paris by Danielle Steel has a predictable storyline, little action and an obvious ending. While the book poses some interesting questions, it does so in a quite superficial manner. It is also poorly written with lots of repetitions and only a small part of the story takes place in Paris so don’t let the title deceive you. The cover is beautiful though.